Special Mysore Pak is a taste of Mysore.As this Sweet is originated from Royal palace of Mysore,it’s named after it and “Pak” basically means sugar syrup.Gram flour ,ghee and sugar are the only ingredients used in this sweet. There are two versions of Mysore Pak,one is the hard Mysore pak which will be brittle, porous texture, uses oil for the preparation and usually distributed during weddings or other ceremonies. Other version is the soft Mysore Pak, it’s one of the ultimate sweet. All you need to do is just put it in your mouth and close your eyes…., Awwww it just melts in mouth,it’s so very delicious. We get one of the best Special Mysore Pak from New Bombay Tiffanys in Sayyaji Rao Road ,Mysore. Its called Special Mysore Pak because,it’s different from regular Mysore Pak in texture, taste as well and pure desi Ghee is used in preparations. To get the real taste of Special Mysore Pak use freshly ground Besan / Gram Flour and Desi Ghee.As festival of lights is ahead, you can prepare this sweet for Diwali Celebrations ,and I am sure you’ll be loving this. Other festival sweets recipes shared on blog are : Mohanthal , Besan Ladoo,Coconut barfi , Kaju Katli ,Pista-Almond rolls , Rasgulla , Basundi ,Rasmalai ,Gajar Halwa , Dates Halwa and Pumpkin Halwa. 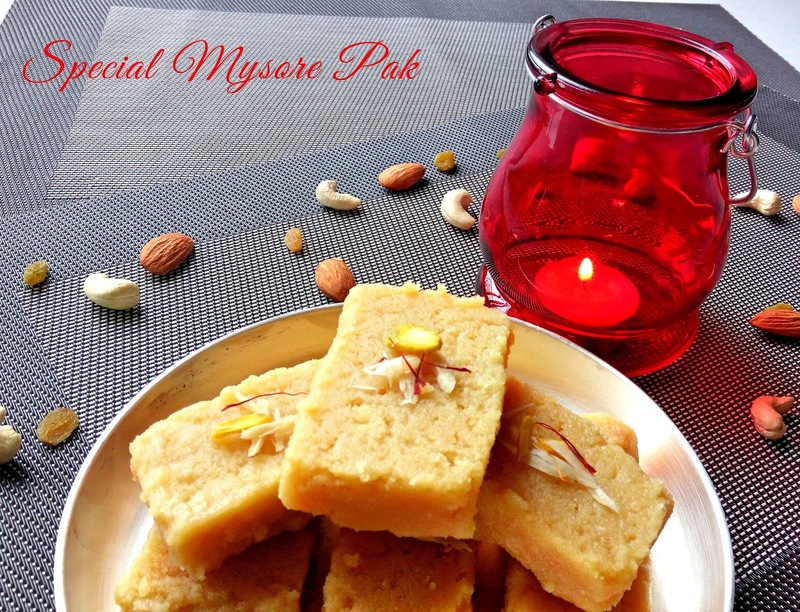 Special Mysore Pak is a simple and delicious traditional sweet from Mysore made from gram flour . ghee and sugar. Sieve Gram flour twice and roast on a medium heat till you get nutty aroma and gram flour turns light golden colour. Add 1 tbsp of Ghee to gram flour ,mix well such that no lumps are formed and turn of the heat. Take sugar in a deep thick bottom kadai /pot ,add water just to immerse sugar. Keep on high heat,let sugar dissolve once it starts to boil ,reduce the flame to medium heat and boil till you get 1 string consistency. Divide the roasted gram flour into 4 equal parts and add roasted gram flour into sugar syrup part by part and whisk well,so that no lumps are formed. Divide clarified butter /ghee into 4 equal parts and start adding it to gram flour sugar syrup part by part, keep stirring and mix well till ghee incorporates with gram flour. Once it starts leaving the edges,add 1 tbsp of ghee. Turn of the heat . And pour the mixture to prepared greased tin ,once warm predefine the shapes and cut it when cools completely. 1. Sieve gram flour and roast it well,until you get nutty aroma.Gram flour colour turns light golden colour. Roast it on a medium to low heat ,take measures not to burn it. Once it’s almost done add 1 /2 Tbsp of ghee mix it well, again add 1/2 Tbsp mix it well ,such that no lumps are formed and turn of the heat. 2. Take Sugar in a heavy bottom deep kadai ( Don’t use nonstick ware ) add water just enough to immerse sugar (Around 3/4 Cup). Keep it on a high flame,once it starts to boil reduce the heat to medium low and boil sugar syrup till you get 1 string consistency. When you touch the sugar syrup between the fingers,you should get 1 String, that’s the right consistency. This is called as “Pak” Now reduce the heat to low flame/ sim.Meanwhile grease the pan /tray/plate and keep it aside. 3.Divide the roasted gram flour/ besan into four parts and add one part of the gram flour into sugar syrup and whisk well so that no lumps are formed. It starts to froth,add 2nd part of the flour ,whisk well and again repeat it for remaining flour. Just make sure you add roasted gram flour part by part rather than adding it all together,just to ensure that no lumps are formed . 4.Take 1 cup Ghee and divide into 4 parts , add ghee part by part thoroughly and whisk , once ghee is absorbed add one more part of ghee and mix well,repeat the process till you complete all 4 parts of ghee. 5. Keep Mixing so that Ghee is well incorporated within the besan. When it starts leaving the edges and looks like foam mass ,add 1-2 Tbsp of ghee mix well . 6. Transfer the mixture to a prepared greased pan,When its still warm,cut into rectangle/desired shapes. When it cools down completely,cut the precut mysore pak and store it in a airtight container.It stays good for 15 days ,you can refrigerate it too. But before serving just microwave it for 20 seconds ,so that ghee melts down and tastes good.